It seems that winter has yet to go out of style in Boston, and so the wooly scarves and snow boots must remain by the front door. Nonetheless, this provides perfect incentive for sticking with hearty meals that can warm a “wintered-out” soul; dishes that I have begun to perfect with my newest love: my Le Creuset 5-1/2 Quart Round Dutch Oven. I had always joked with friends that the man who bought me a Le Creuset would be the man I marry. Yet prince charming was taking his sweet time, so I bit the bullet and bought my own – probably one of the best decisions I have ever made. This is THE pan for those who love to cook: it is extremely durable, and has a lifelong guarantee. 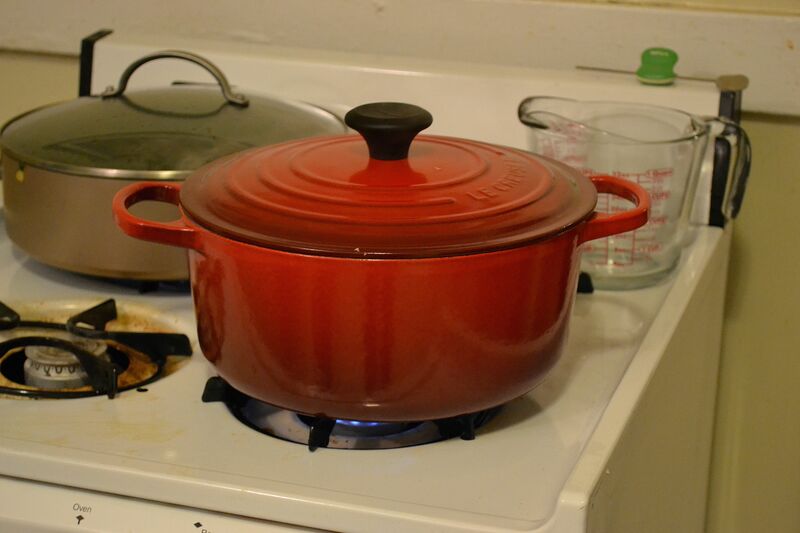 Added bonus – the shape and size of my Le Creuset is the exact same as Julia Child’s favorite! If that’s not fate, then I don’t know what is. While this pan is great for cooking a variety of dishes, it makes fantastic stews! 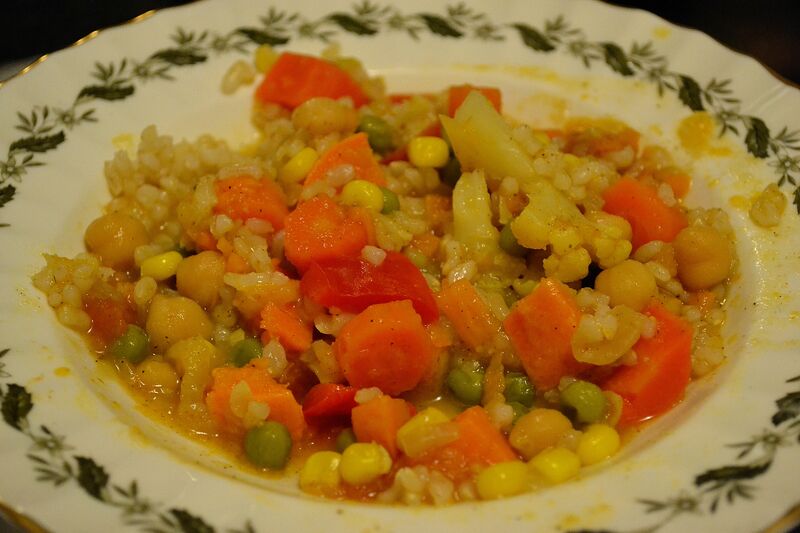 So, I thought I would share one of my favorite vegan-friendly recipes – Vegetable Curry Stew with Chickpeas. My stepmom and I created this recipe while I was still a vegetarian (a worthwhile effort, but I inevitably returned to the “dark side”). 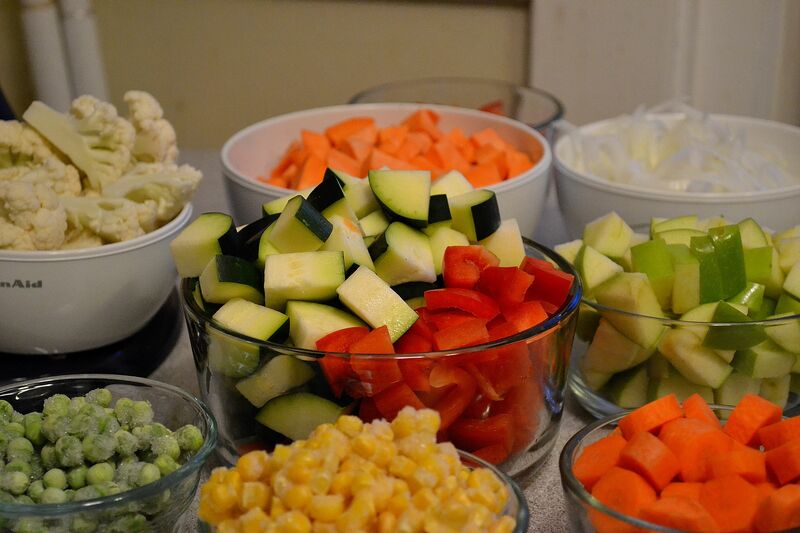 We wanted a stew that was chockfull of vegetables and packed with flavor. After ransacking the fridge and scouring the pantry, we developed a hearty, vegan stew that even meat-lovers can enjoy! 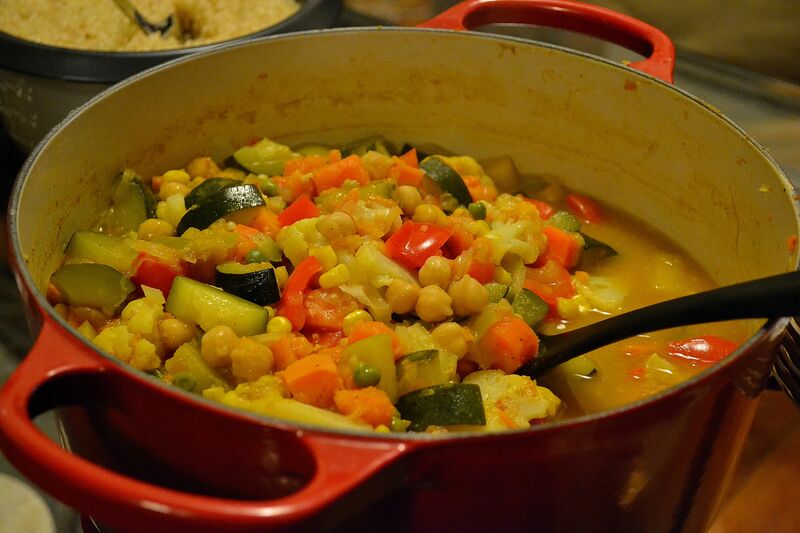 We modified a more basic vegetable curry from Annie Somerville’s Field of Greens cookbook – a fantastic resource for great vegetarian dishes. The directions accommodate the different timings for each vegetable variety (no one likes a soggy stew!) Dried chickpeas can be used in place of canned, but they would need to be soaked overnight, and cooked for a longer period of time than the canned variety. You can see find the recipe for this stew HERE. 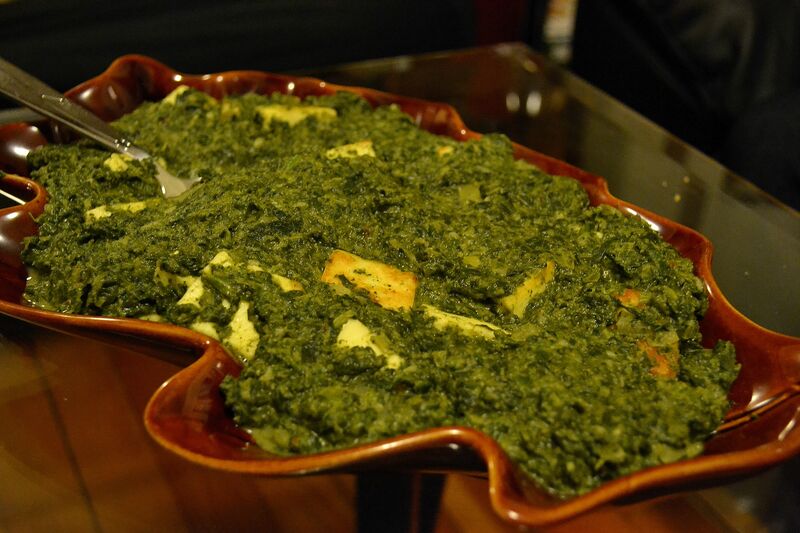 My friend Tim made a GREAT Saag Paneer (Spinach with Cheese), which you can find the recipe for HERE. Initially I had thought to pair this dish with Rimsky-Korsakov’s Scheherazade, yet realized I should acknowledge the Anglicized context of curry. As such, I chose to pair this piece with British composer Benjamin Britten, and his work Serenade for Tenor, Horn and Strings. Not only is this an iconic work of Britten, but also so happens to have been composed during the British Raj (it was composed in 1943). * I first heard this piece performed by a dear and talented friend at the New England Conservatory, and was instantly smitten. I hope you enjoy it as well! Note about the recording: the horn player (Danilo Stagni) is playing a natural french horn on the opening prologue, and his intonation is a HUGE achievement for that instrument! This particular set of recordings is broken up into three parts on YouTube, but the piece is actually divided into 8 separate movements. I’ve included a link to Part 1 below, but I highly recommend listening to the entire work. It’s a fantastic piece, and this a solid recording! (The Dirge is my favorite movement – see 6:11 of Part 2).